Share the post "The JFrame"
The JFrame component holds all the other components. It is the window of the application. 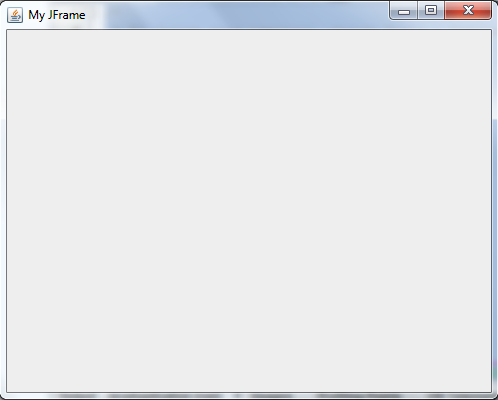 You can set the title of the application in JFrame which commonly found on the upper left side of the application. frame = new JFrame() – Create an instance of JFrame and store it to the variable frame. frame.setTitle(“My JFrame”) – Set the title of our frame that can be found on the upper-left part of the frame. frame.setSize(500, 400) – Set the size of our frame by 500 in width, 400 in height. frame.setDefaultCloseOperation(JFrame.EXIT_ON_CLOSE) – set what will happen when we click the X button (close button) on the upper right of the frame. This method means to exit the program when we click the close button. frame.setVisible(true) – Make our frame visible. Setting it to false makes our frame hidden or invisible.